From September 4th until September 29th, 2017, JICA Global Plaza will exhibit Palauan culture along with its unique identity and characteristics. The exhibition, which will be held at the 1st floor lobby, displays numerous Palauan traditional handcrafts, such as the Palauan traditional storyboard, as well as various information about Palau’s famous tourism sites. Various Palauan traditional dishes are also available to try at the J’s Café in the 2nd floor. Do not lose the opportunity to taste the delightful dishes of the Palauan, since it is indeed a rare opportunity to find Palauan food in Japan. Furthermore, there will also be two seminars held at JICA Global Plaza which will be related to the Republic of Palau. The first seminar will be held on Friday, September 22nd, 2017. The topic will be about realizing eco-conscious tourism in Palau along with its process and other related stories and it will be brought to you by Mr. Hideyuki Shiozawa, Senior Program Officer from the Sasakawa Peace Foundation. The second seminar, which will be held on Monday, September 25th, 2017, invites Mr. Takehiro Kurosaki, Deputy Director of The Pacific Islands Center to talk about Japan-Palau relations. 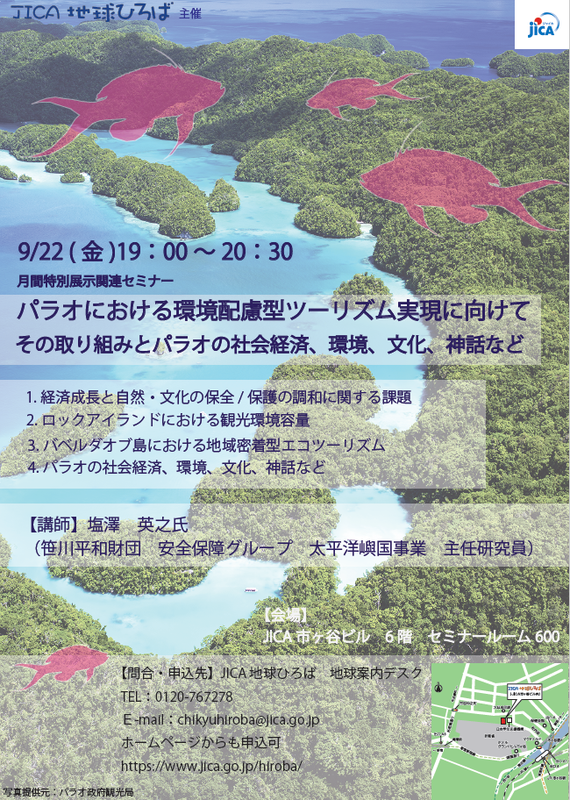 This month at JICA will be dedicated specially for Palau. We would like to warmly invite all of you to the exhibition and learn more about our Pristine Paradise, Palau.